Wooden Peg Hammering Bench is a traditional toy which has been loved and played with by children for generations. This bench has a clever addition so you can't lose the pegs. Bang the pegs on one side of the bench and it makes the pegs pop up on the other side. Turn it around and start all over again. 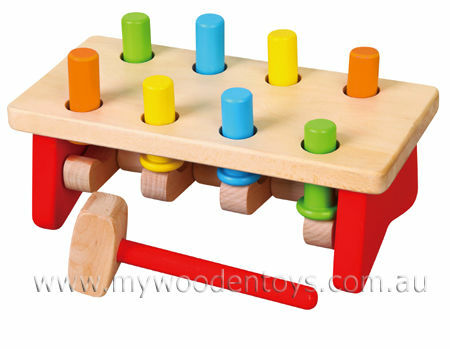 Peg Hammer Bench comes with eight multi color pegs, a strong hammer and a sturdy bench with strong legs. This Toy will take some punishment and is a great way to direct your active little ones energy. A great fun toy you are allowed to hit! The pegs can also be pushed through by hand for those times a hammer seems a bit scary. Size: 22cm long x 10cm x 10 cm Hammer is 14cm long. Material: Wood with Child Safe Paint. Recessed rubber rings hold the pegs in place. We like this because: "A classic, traditional toy that has been around forever, a real favorite." Excellent service ...toys arrived very promptly and the toys were age appropriate for my 15 month old grandson ...no little bits to put in his mouth ...and will be good for him for quite a few years. The toys were made well and very sturdy, as they are dropped a fair bit but are still as good as new ...excellent toys and service .